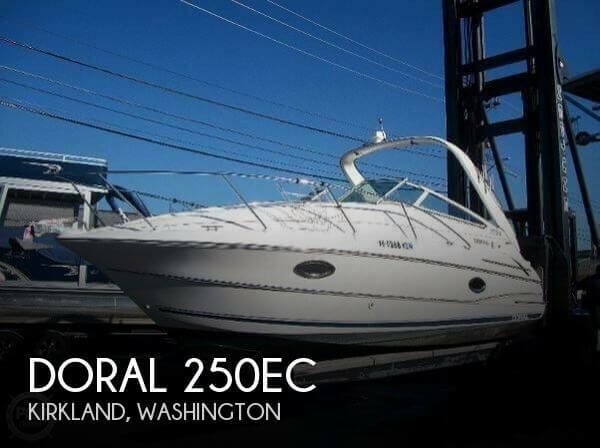 Don't miss this Loaded 2005 360 Doral!! !This One Of A Kind Doral is powered with Twin8.1Volvo Gi 375 HP! You won't find abetter performing Doral at this price. Maintained with an open check book, this is one not to be missed. She is a sleek and sophisticated midrange cruiser designed for entertaining and weekends away. With enough accommodations to sleep 6, your sure to have a great time aboard this beauty! All the comforts of home with stylish features and quality craftsmanship. Don't let this opportunity to own one of the finest midrange cruisers pass you by! Cockpit This Doral has cruising and entertaining designed from bow to stern. The boat has nice lines that scream ?Take me for a boat ride!? The cockpit offers two separate built-in couches that offer plenty of seating along with a cocktail table and wet bar. All of this and she still has easy access to theswim platform. The extended swim platform provides lots of accessibility along with built-in bumper holders and two storage lockers for keeping lines and shore hook-ups handy. She even has room for a dingy or personal water craft in back. Helm With a two person seat the helm has great visibility of your surroundings and your gauges. The helm seat has a flip up bolster for enhanced visibility or for standing while driving. The solid wood steering wheel has matching accents on the dash. Main Salon The salon can be entered through a slider with a built in screen door which is a nice feature for cool evenings or when the mosquitoes are buzzing around. Down a few solid wood stairs and you are ready for relaxing or entertaining. To starboard is the power distribution panel. The panel has all your breakers, shore power and generator options and digital read outs of water supply and voltages. The cabin has an abundance of natural light from port holes, three hatches and a skylight. The galley includes cherry wood cabinets and a two-burner stove, microwave and a matching marine refrigerator. The counter top is a nice selection of Corian. The cabin floor has a molded fiberglass liner with carpet and a teak and holly sole for the galley. There are two loungers inside that provide plenty of seating for your company to sit and chat, or relax and watch a movie on the TV. Master Cabin The Master Cabin is forward of the salon through with a full size privacy door, not a sliding curtain that you find in most boats. In addition, the aft stateroom also has a separate sink. A large comfortable bed with separate air conditioning or heat to ensure a great nights sleep. Deck This Doral has plenty of optional extras to enhance your ride. Everything is provided for safe cruising. Engine Room You can gain access to the engine room through a day hatch. For complete access there are two power assist hatches to give you all the room you need. With the hatches open you have plenty of light and room to service the engines. The engine room is well laid out with neatly secured wiring and accessible batteries. Even with the optional generator there is still room to spare.